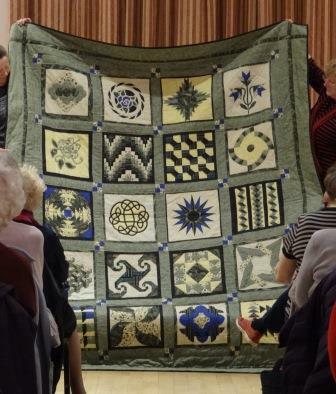 This delightful and very well attended evening was a lovely way to round off 2015. 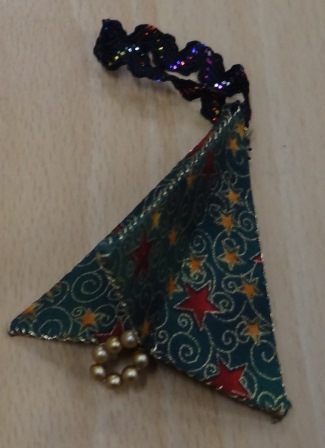 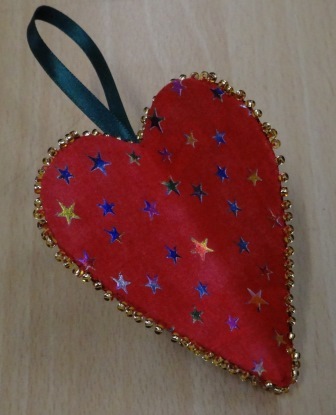 There was a Christmas Project to keep us busy while we caught up with friends and the committee served us with tea and mince pies to keep up our energy. 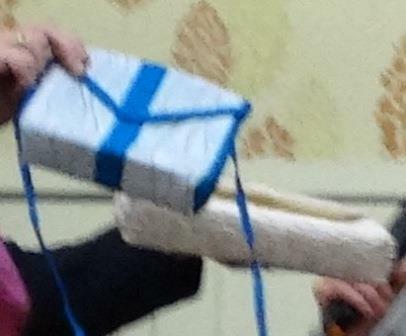 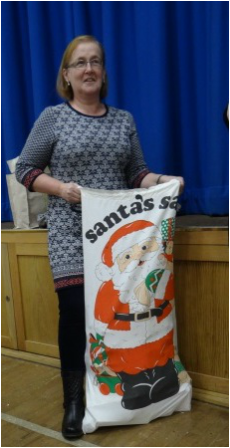 We were inspired by Show and Tell and everyone received a present from Santa's sack in the Grand Raffle. 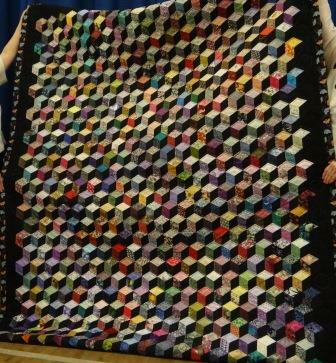 With a talk on "The Silk Road to Birmingham from China" we were intrigued to find that there are many different types of silk including spider, tussah and mulberry. 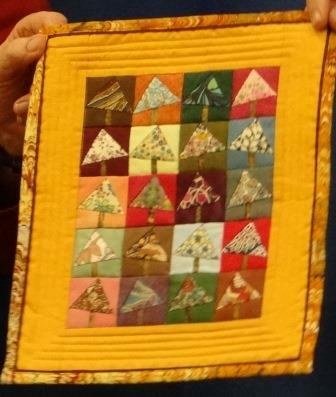 Teresinha showed us whole cocoons, silk filaments, silk fabrics and even a silk moth with the most beautiful subtle colours in the wings as she talked about the commercial production processes and the joys of raising silk moths at home. 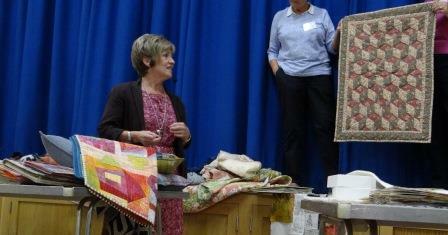 She took us through a selection of different silk fabrics and we were delighted to find out how silk dupion is made. 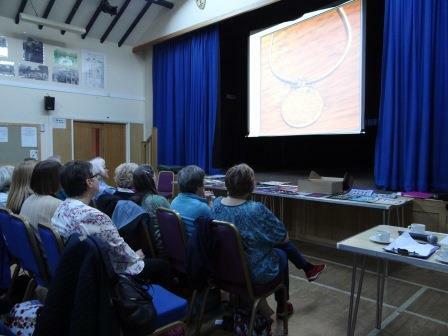 A truly fascinating evening. 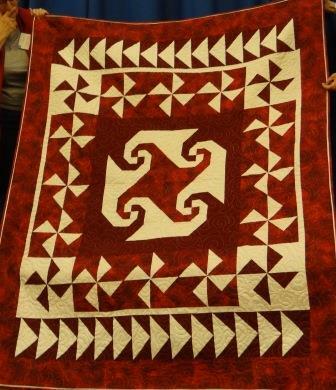 Thank you, Teresinha! 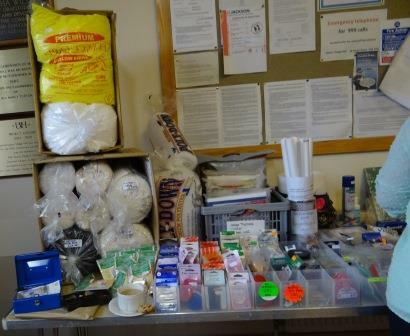 The evening started with a cup of tea and the chance to purchase much needed supplies from Dot and Marion. 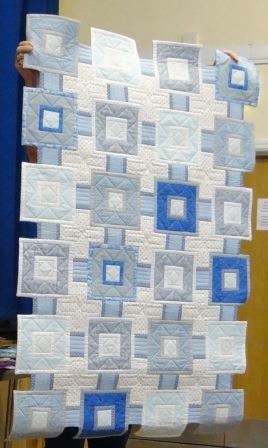 Members picked up the latest Block of the Month patterns and exchanged news of current progress with the programme. 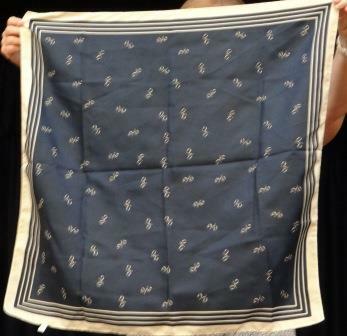 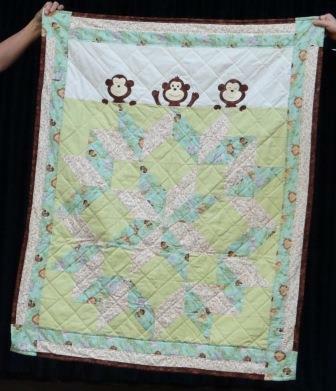 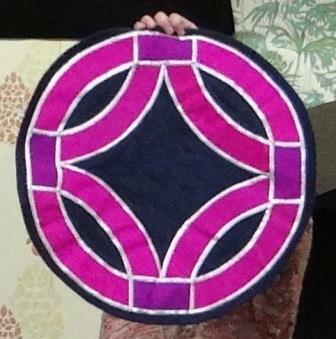 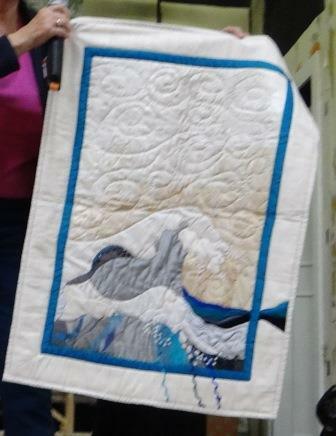 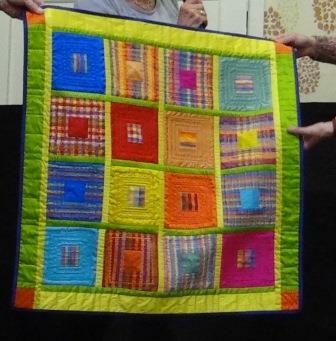 After an inspiring "show and tell", Sian introduced us to the Group Raffle Quilt project. 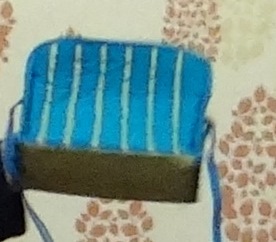 We were each given a pack with fabric and a pattern to make a house block. 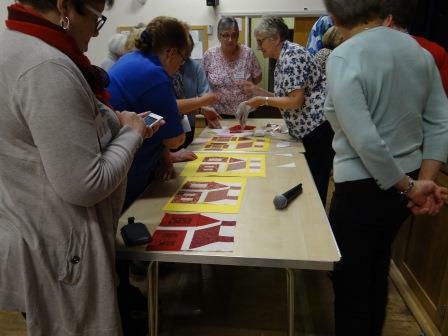 Sian and Jackie were available to talk through the different options for assembling the house block . 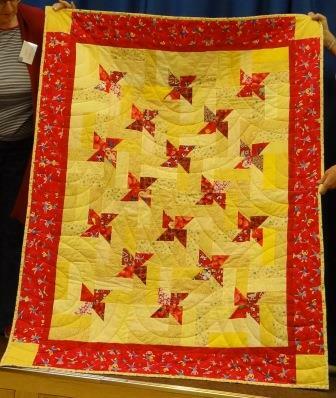 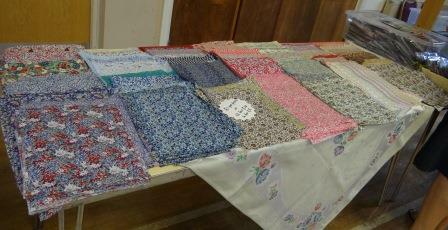 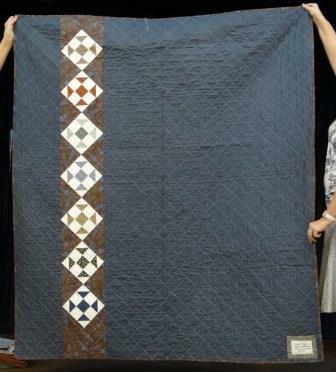 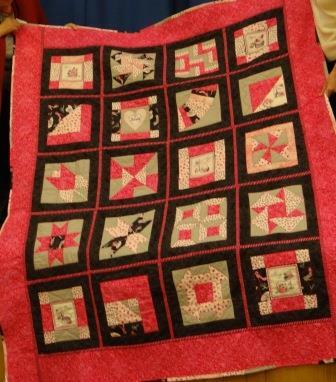 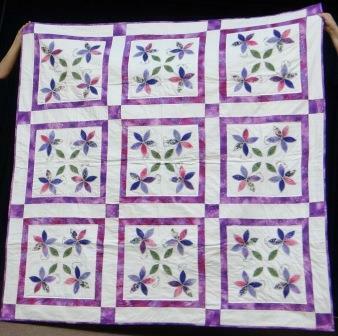 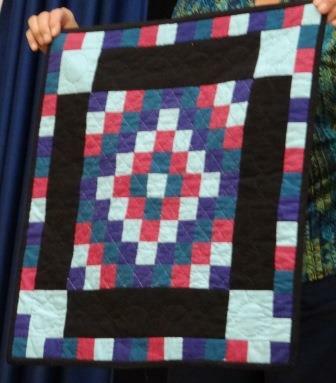 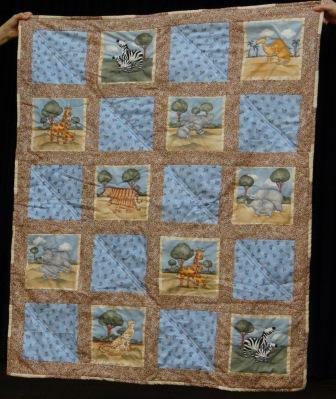 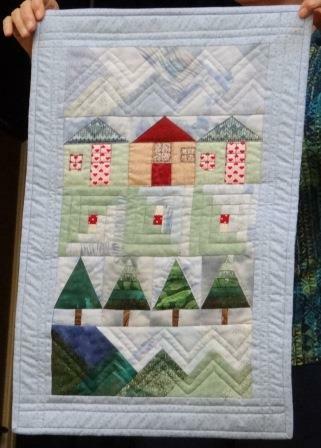 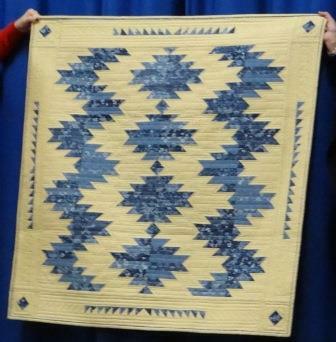 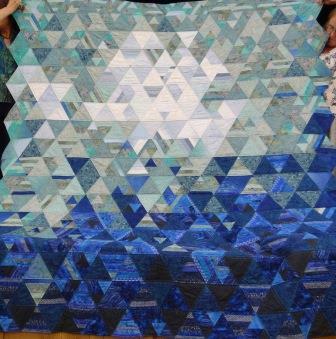 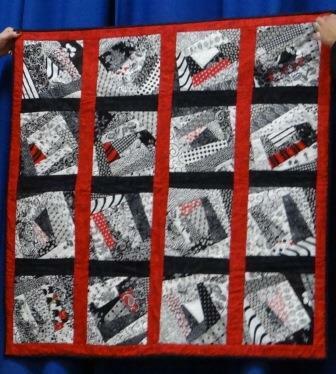 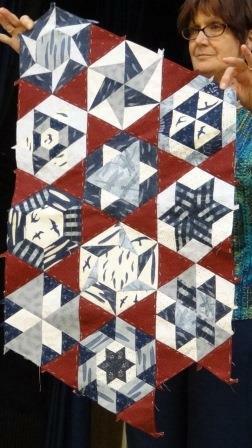 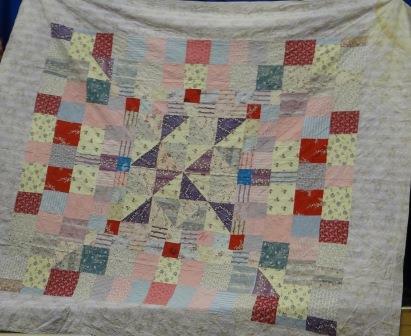 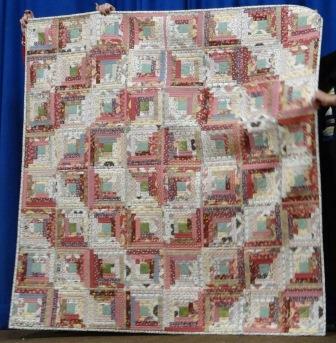 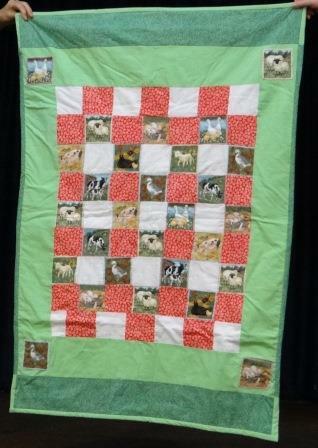 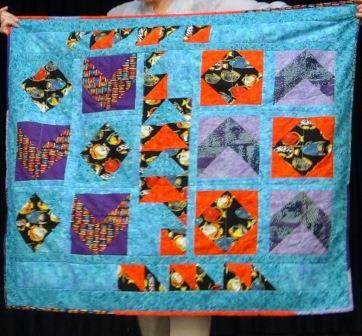 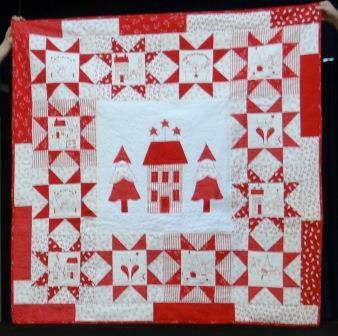 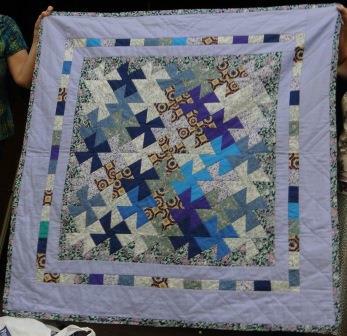 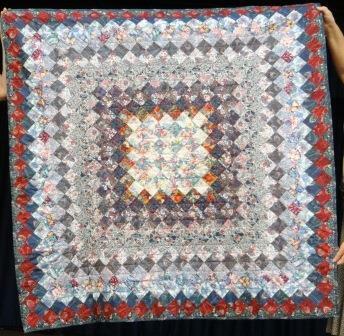 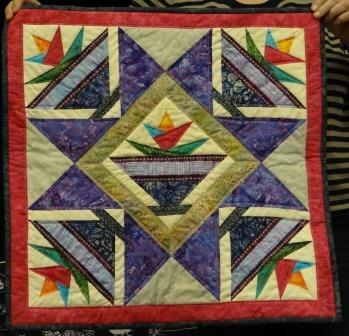 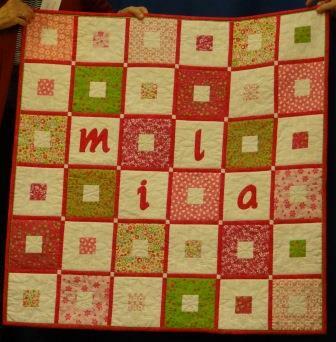 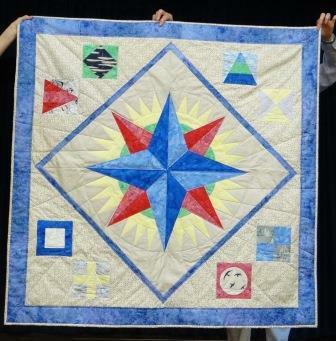 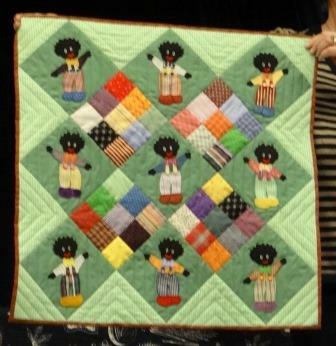 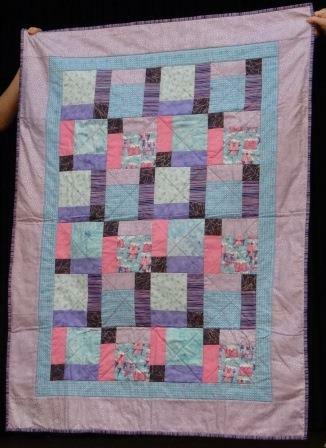 The blocks are to be returned by no later than January so that a small group can get together and assemble the quilt. 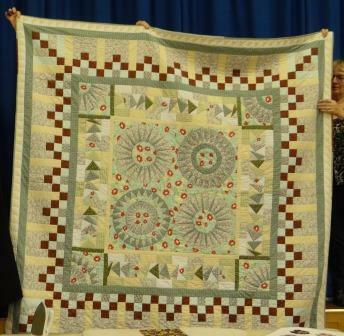 There was a buzz of excitement as we caught up on news after our summer break and the next Block of the Month patterns were collected as we compared notes on where we were up to on that project. 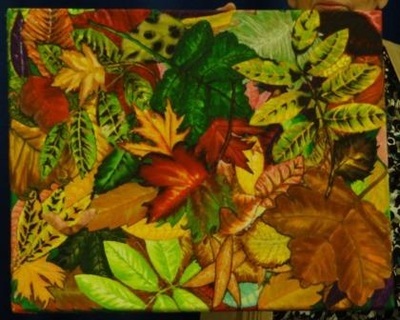 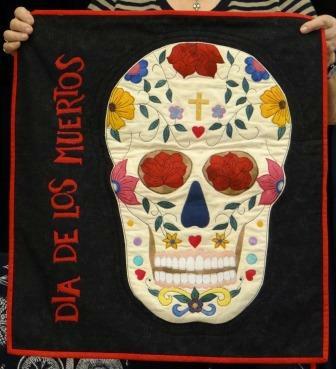 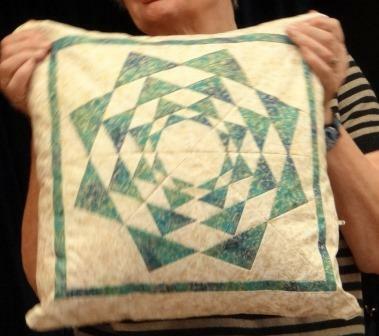 Soon it was time to settle down and listen to our speaker for the evening - Linda Paris - and we were awe struck as she took us through her quilting journey showing us quilts, cushions, notebooks and design pages. 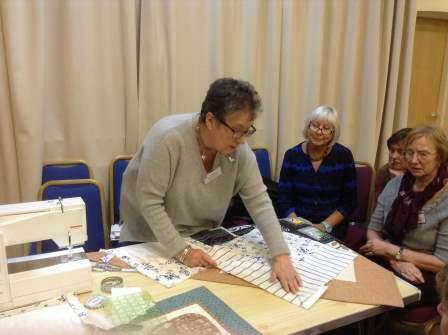 Linda also demonstrated how she uses screen print techniques to create wonderful fabric designs and some members were even able to have a go......how good is that! 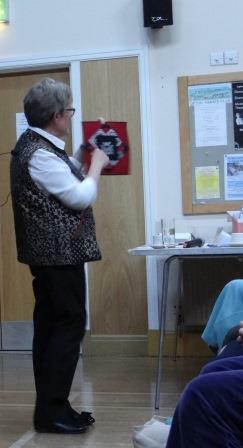 Thank you to Linda for a very inspiring evening! 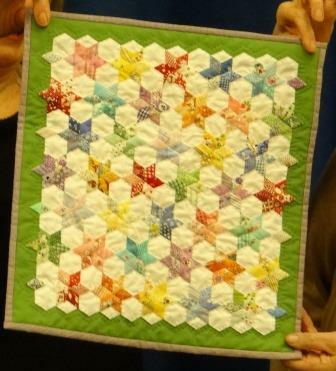 After a cup of tea and an opportunity to pick up the next Block of the Month patterns we were able to shop for much needed supplies with member sales, Marion's Bits and Pieces, and our guests for the evening - Bumbleberry Fabrics. 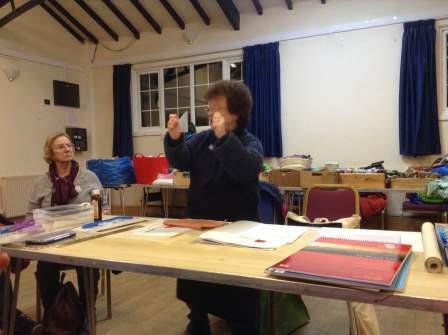 We then settled down for a much loved highlight of our year with members showing a selection of their work to the group. 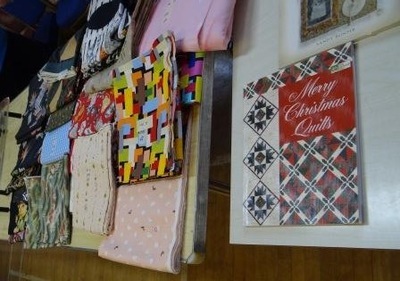 It is always a delight to see the wonderful variety and range of items and this year more than lived up to expectations. 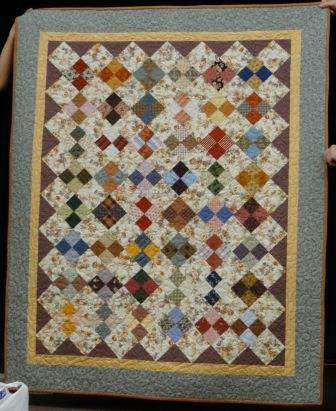 A huge thank you to everyone ! 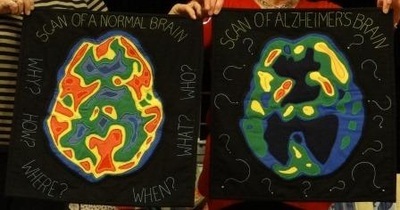 How could we fail to be inspired ? 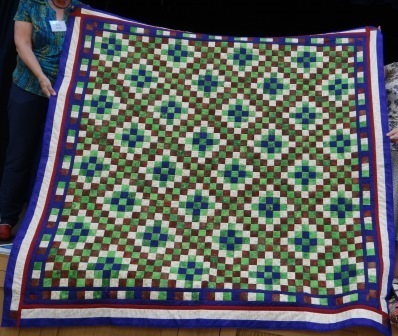 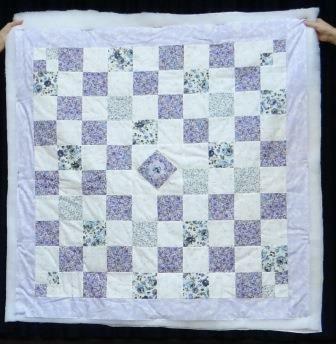 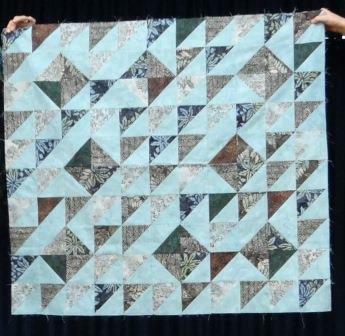 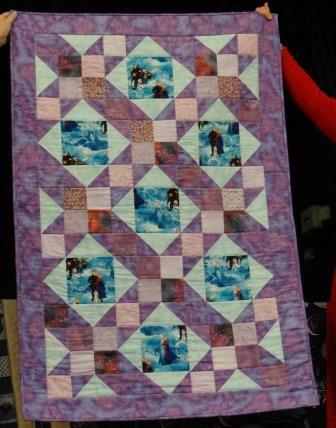 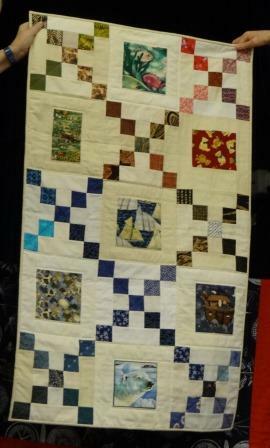 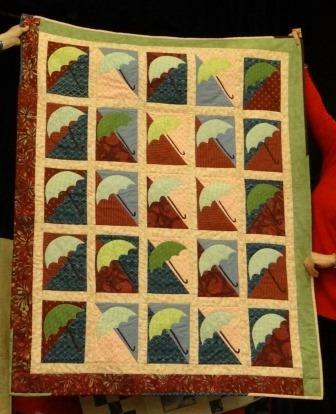 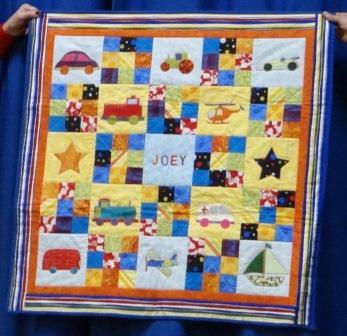 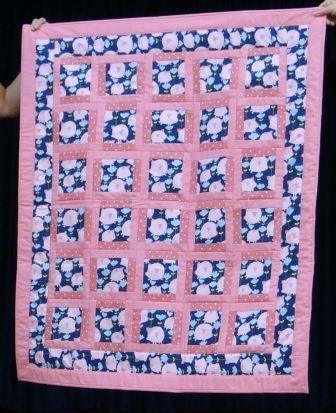 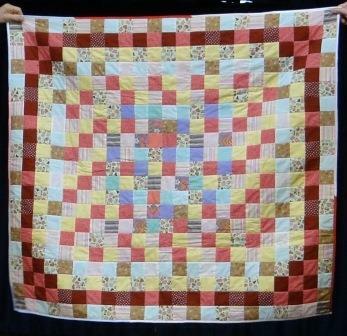 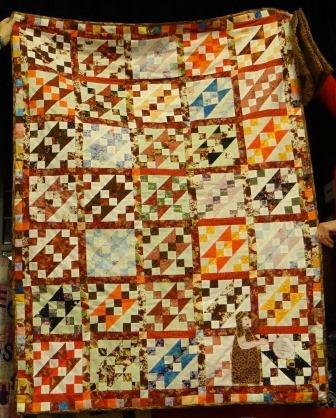 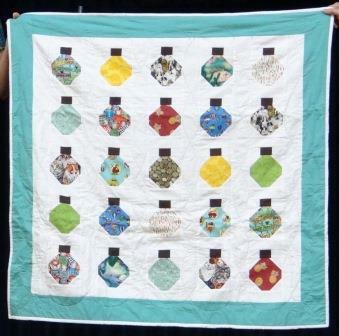 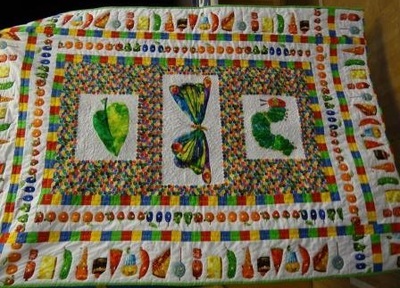 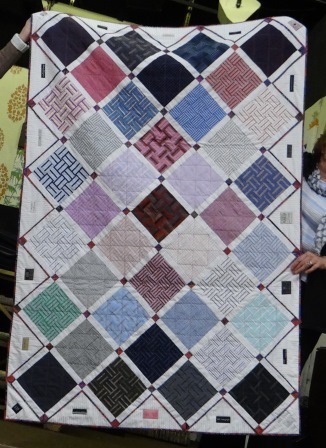 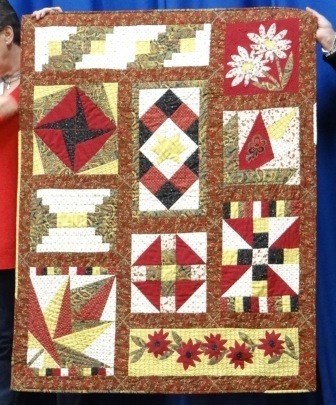 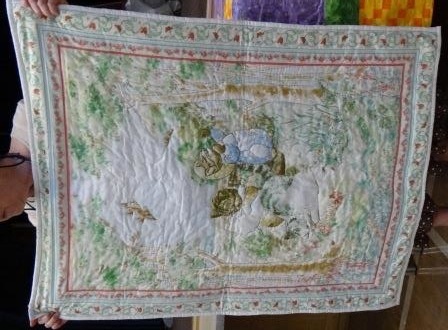 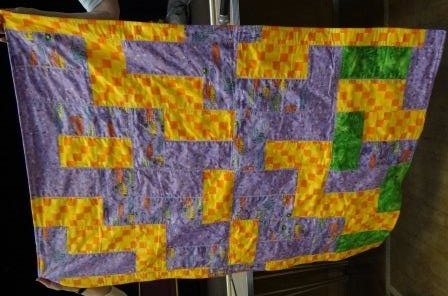 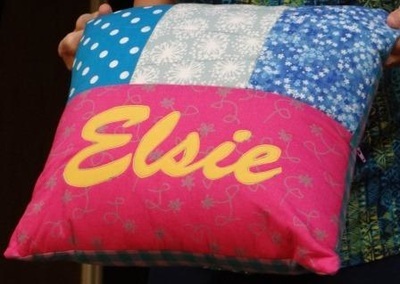 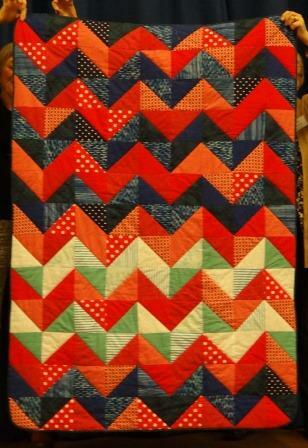 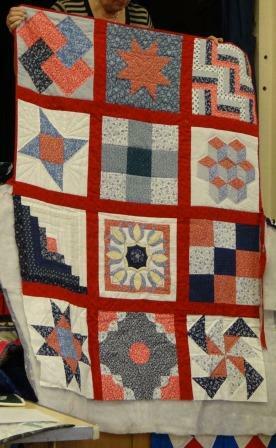 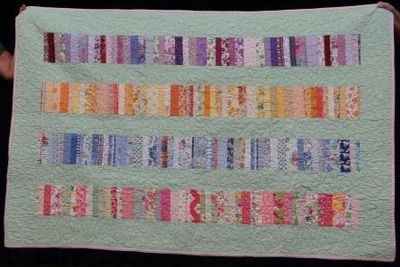 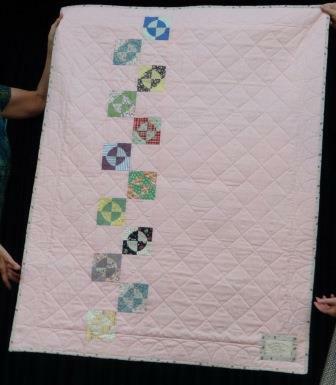 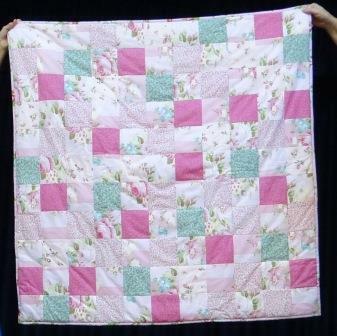 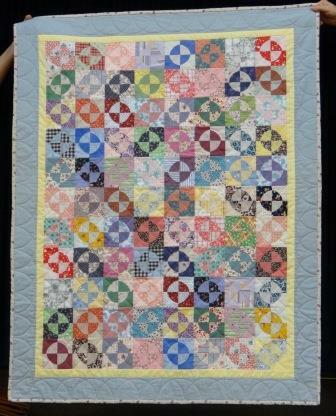 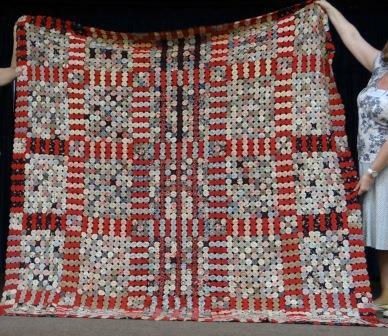 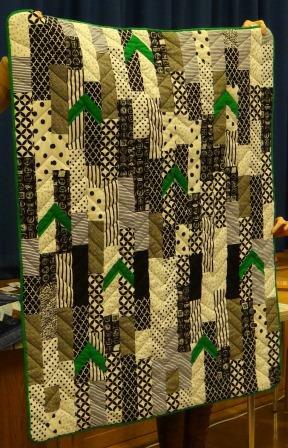 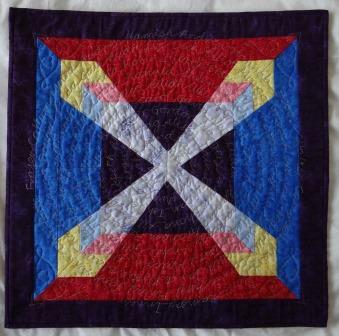 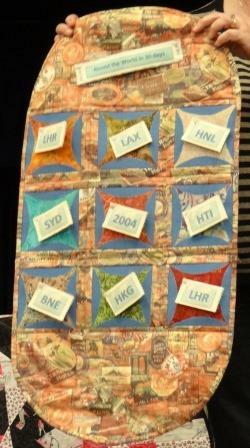 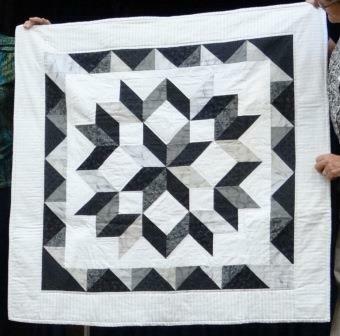 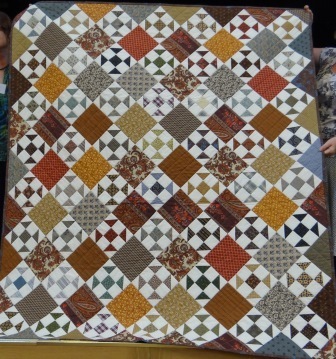 "Fifty Quilts in Fifty Minutes" - and oh what a joy. 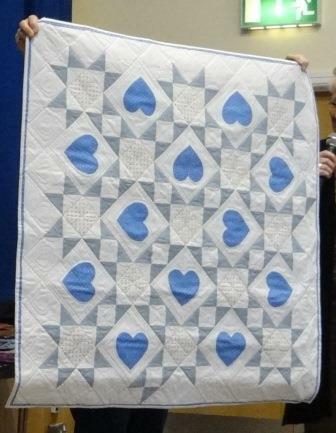 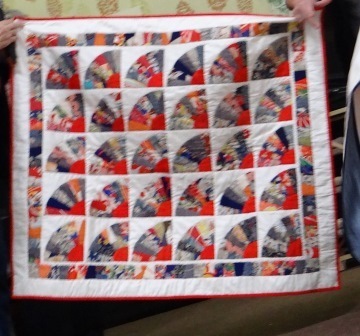 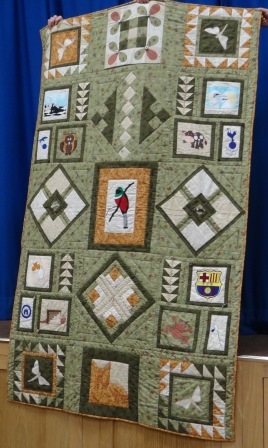 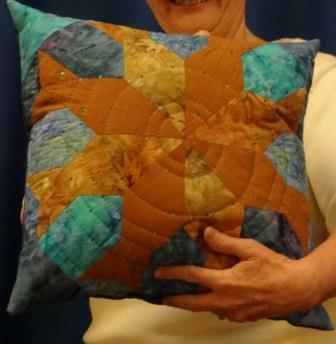 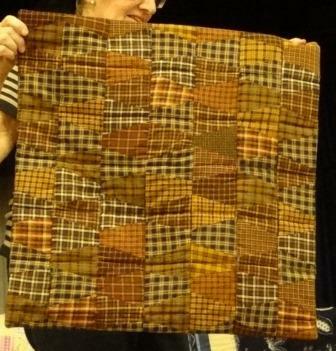 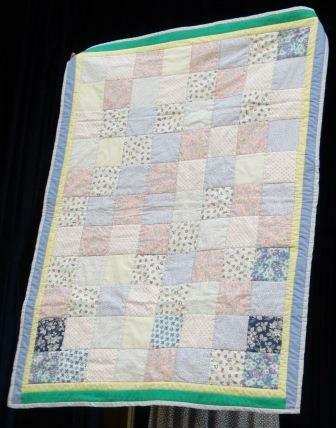 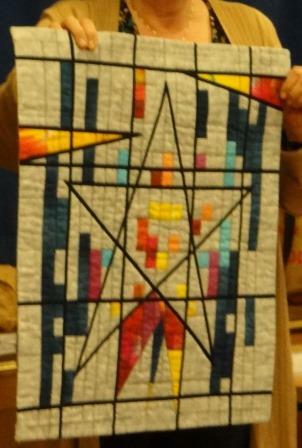 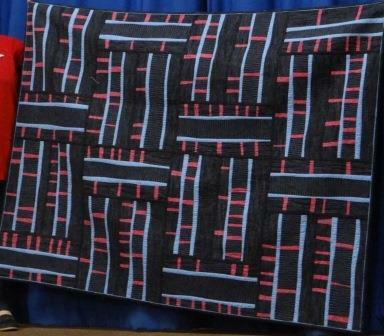 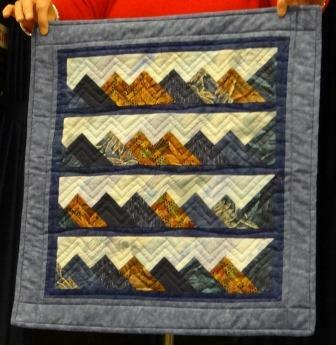 Maureen is a very entertaining speaker and as she showed us a wide range of quilts from early days to recent projects she made us laugh with her many anecdotes. 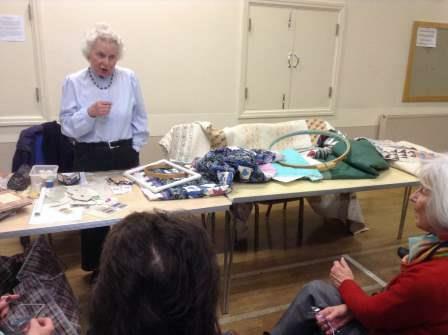 Although Dot was not able to attend, there were lots of opportunities in the early part of the evening to stock up on supplies and "must have" items with Marion's stall and a number of member's sales. 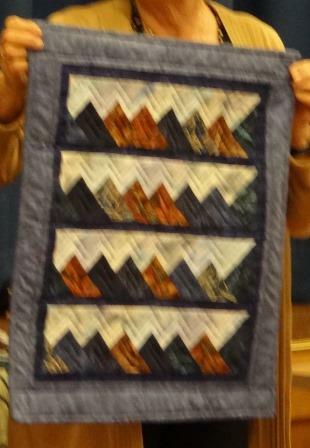 What a very enjoyable evening. 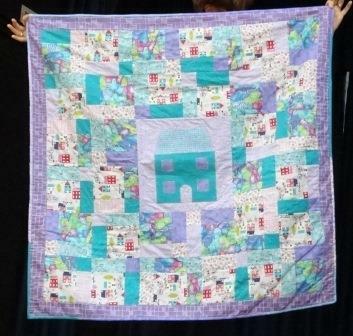 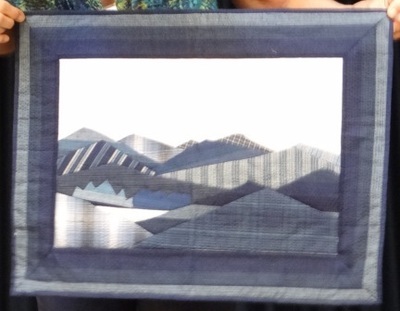 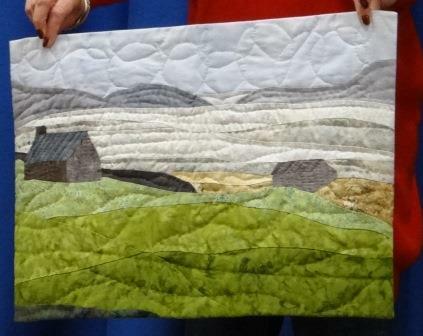 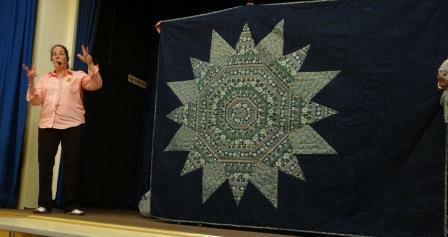 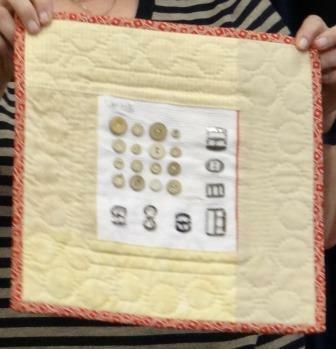 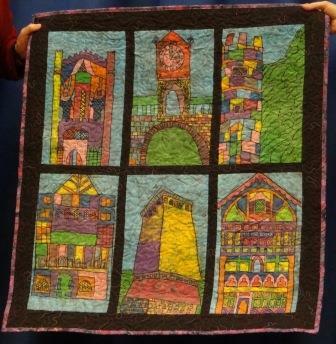 Sarah Hadfield talked us through some of her quilting journey and her explorations of miniature patchwork and quilting. 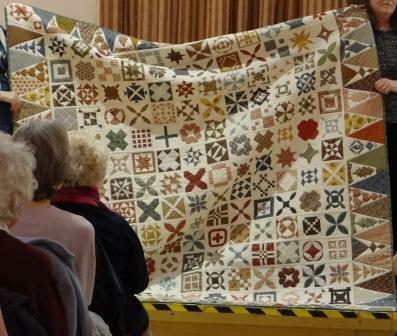 Having seen a number of the quilts on the screen during her talk (blown up large), we were able to gather round afterwards and see the real things (small, very small). The members signed up for the workshop are sure to have a delightful day. 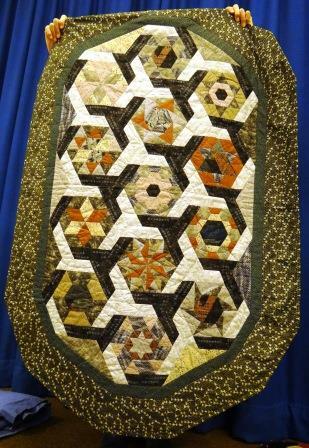 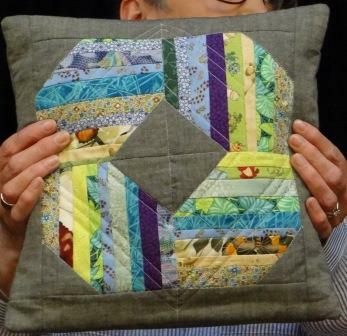 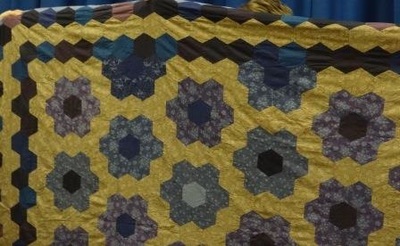 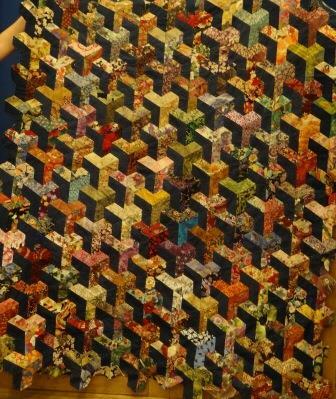 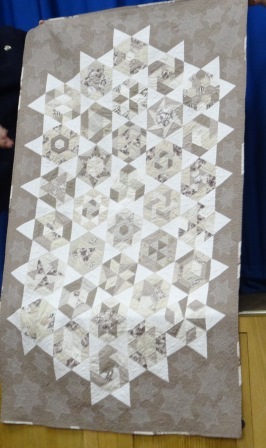 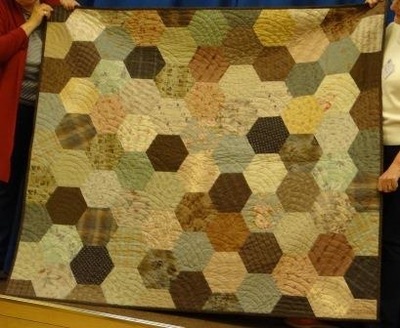 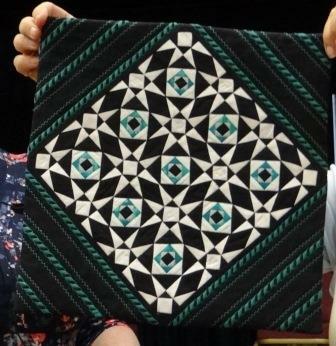 This is a new look at traditional paper piecing techniques - based on the hexagon, but with a twist. 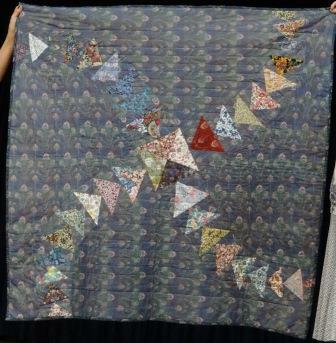 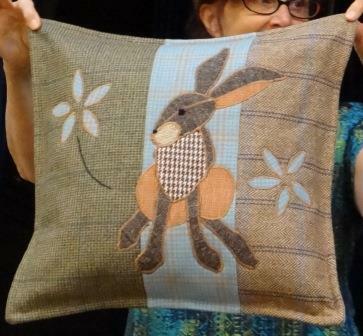 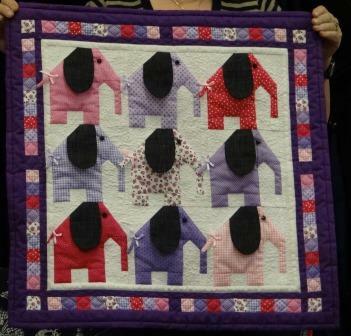 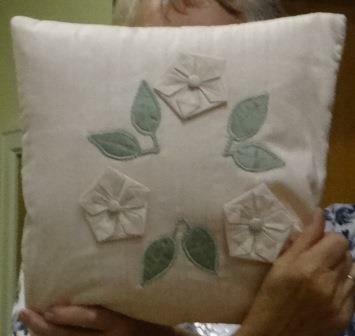 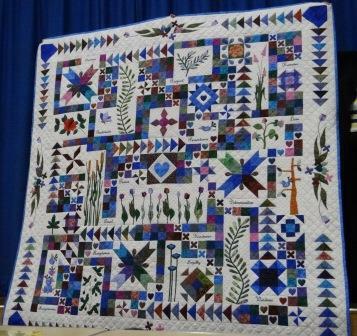 An enormous Thank You to Dyffryn Clwyd Quilters for a delightful evening! 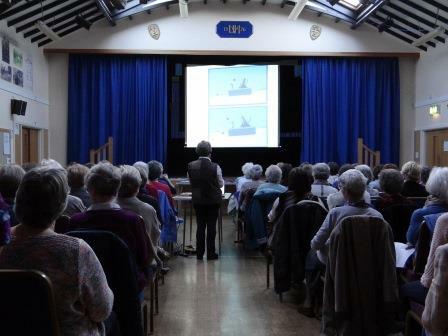 The final meeting of the 2014-15 year was the AGM. 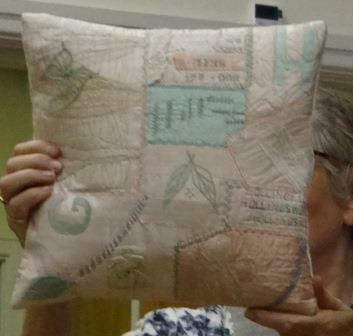 In her Chairman's Report, Jacky reminded us of the many lovely events we have enjoyed and Cathy took us through the final published accounts for 2014. 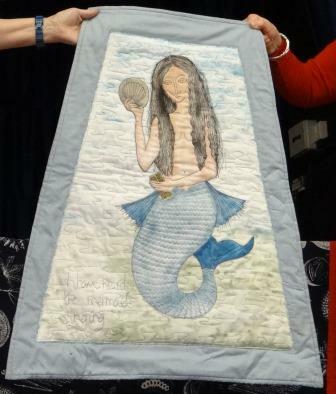 We are pleased to welcome Ruth Wooles and Val Sutton on to the committee, and our thanks go to Catriona who is standing down. Lyn put a few Linus quilts on display and packs were available for people to take home and make a quilt for Linus over the coming months. 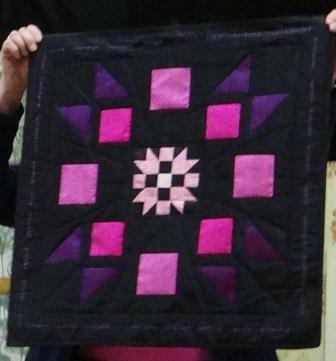 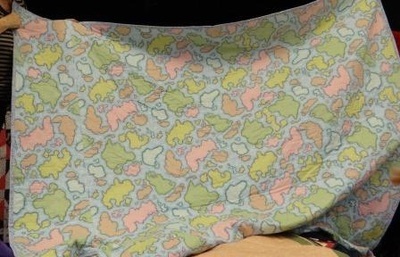 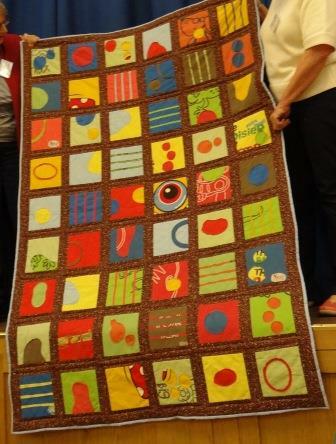 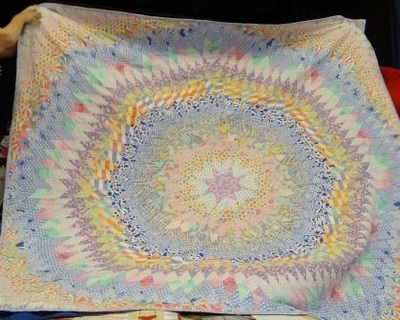 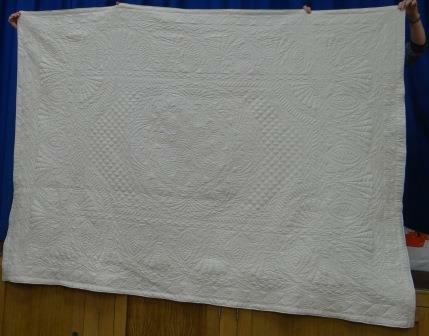 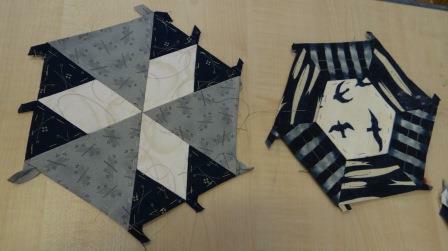 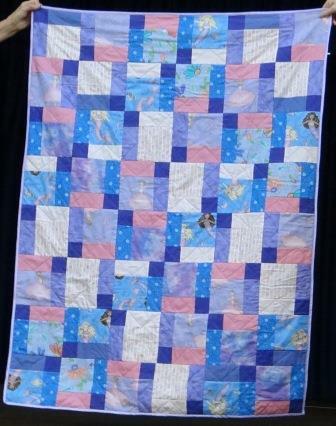 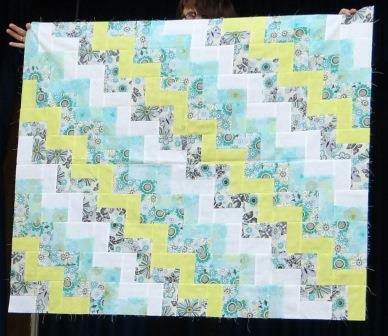 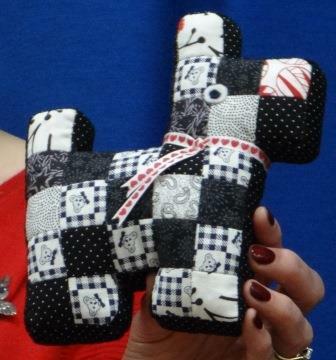 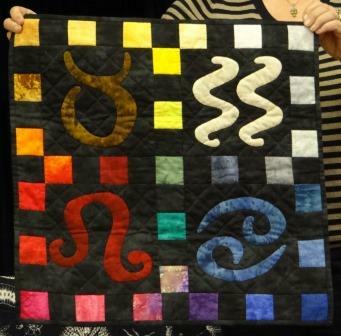 We have a UFO session scheduled for Friday 8th May when we can get together and produce quilts for Linus. 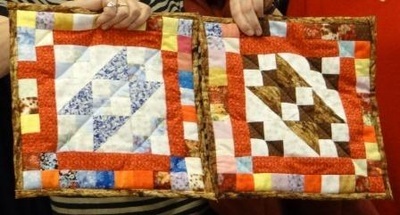 Hopefully with a whole day at our disposal we will be able to give the project a huge boost. 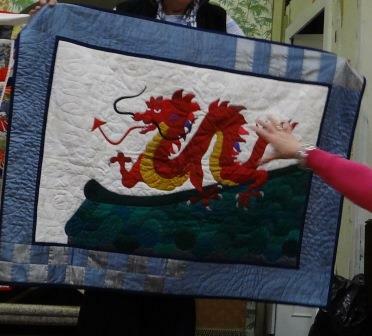 Our Charity of the Year for 2014-15 was the Chester Sexual Abuse Support Service and Jacky was able to present a cheque to their representative (and a member of our group) Su Sisung. 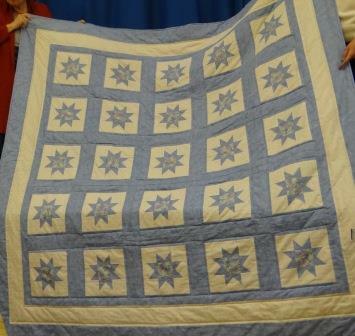 The "Suitcase Collection" was laid out for people to see and individuals were able to reclaim quilts if they wished. 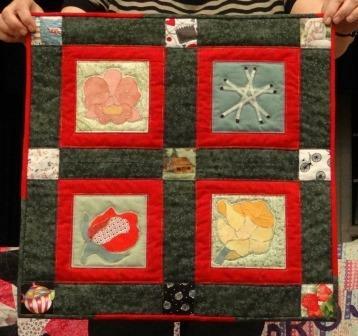 In the second half of the evening we enjoyed a "show and tell" of Remembrance Challenge quilts and these will be added to the suitcase for a while. 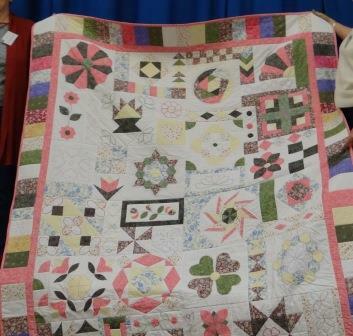 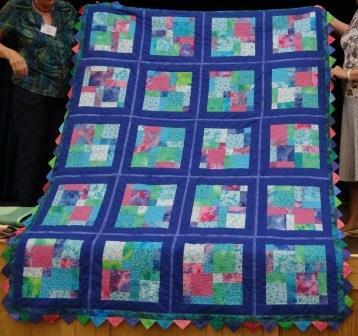 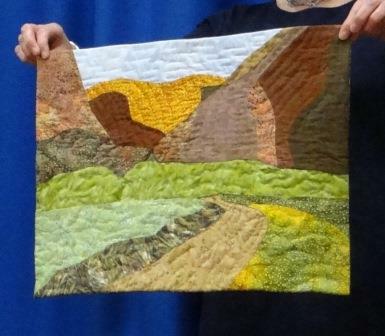 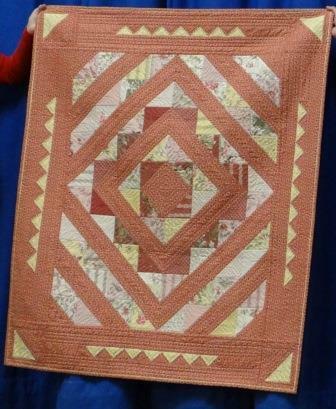 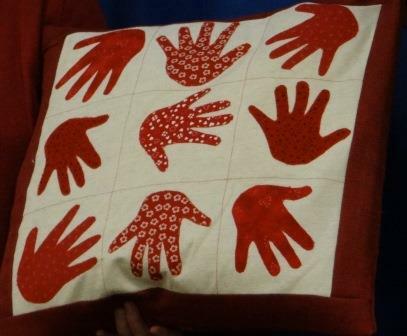 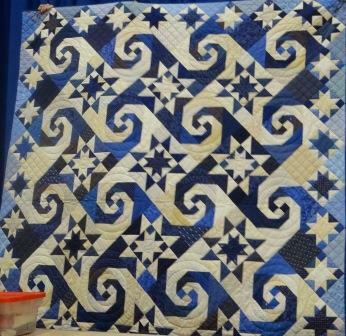 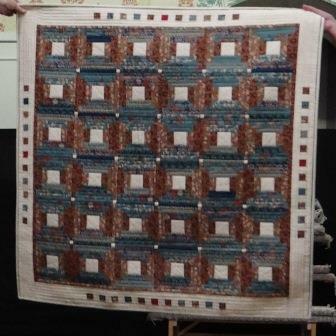 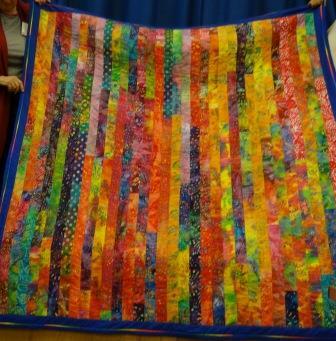 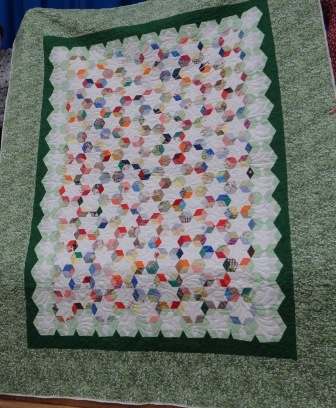 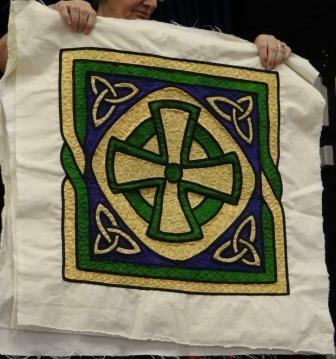 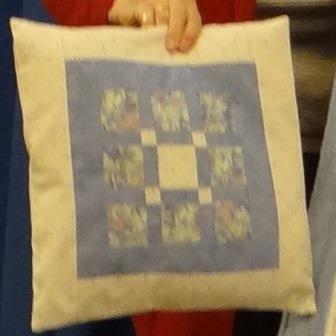 We also enjoyed a "show and tell" session with other items members have made including a "touch me" quilt made by Carrot Cake Quilters which has been used at exhibitions for people to see what quilting is all about. 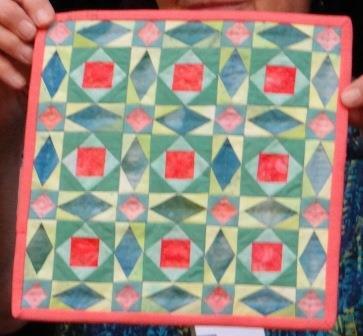 We enjoyed a lovely evening with four different 20 minute demonstrations/workshops - mitred corners, folded patchwork, hand quilting and making templates. 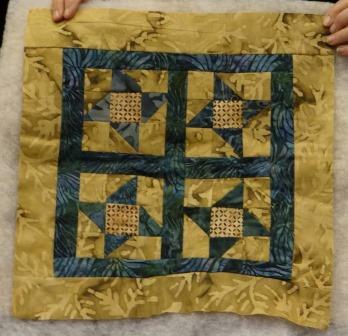 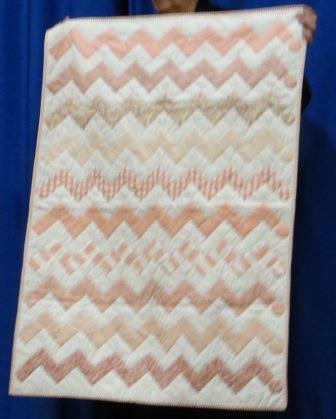 beautifully mitred borders and bindings with easy to follow step by step demonstrations and instructions. 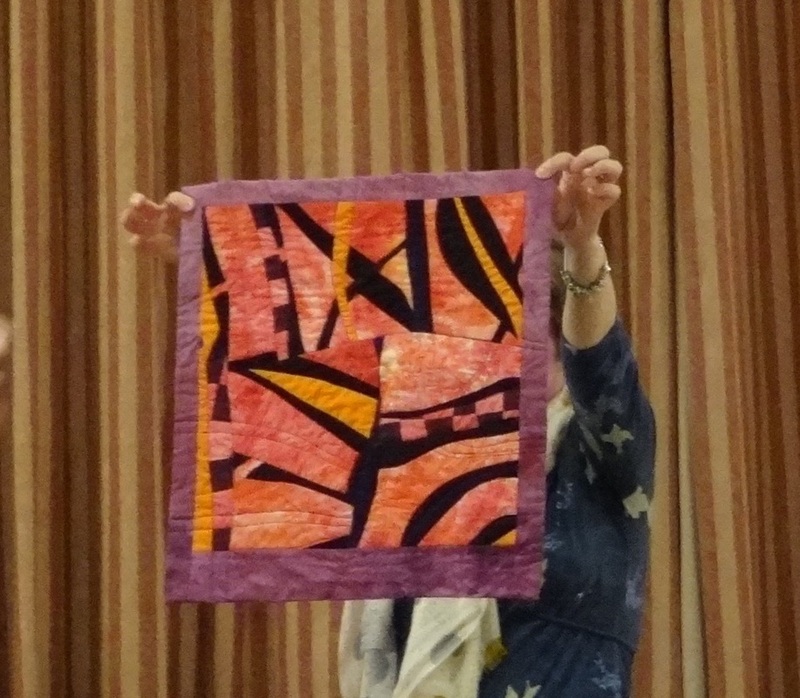 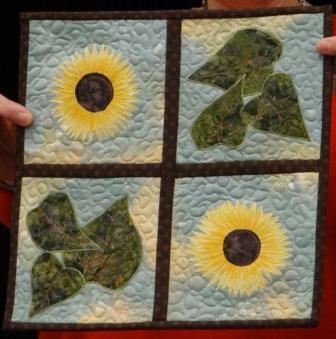 Gill Young took us through all the steps for creating a "folded patchwork water lily" with the addition of half square corners to create an interesting square patch. 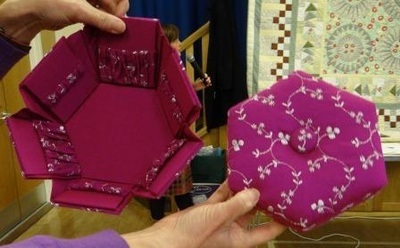 Mary Ranby talked us through hand quilting equipment and techniques with two lovely old quilts to illustrate contrasting approaches. 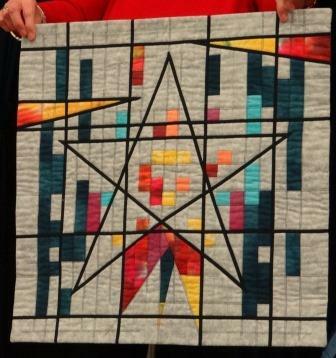 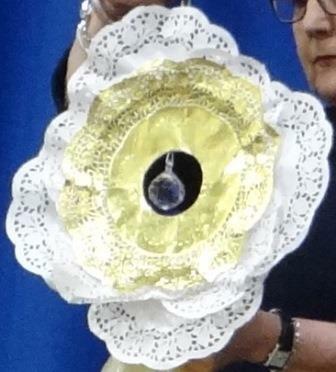 Catriona Thompson described the tools and techniques involved in creating the different types of templates for piecing, fussy cutting, applique and quilting. 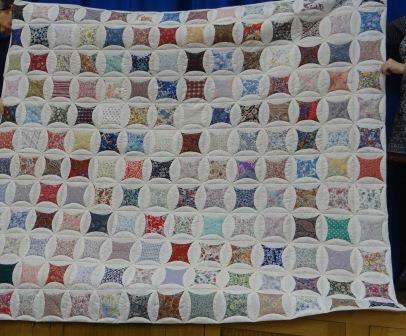 A huge Thank You to Sian, Gill, Mary and Catriona!